Sold in Sheets 8 x 12"
IMPORTANT NOTE: Oceanside Glass and Tile has been working hard to produce the full line of System 96 styles, however some may not be available until later in 2019. 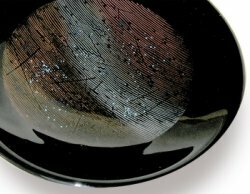 AVENTURINE COLORS, 8 X 12"
WHITE AND OFF-WHITE SOLID OPAL SHEETS, 8 x 12"
BLACK SOLID OPAL SHEETS, 8 x 12"
Dazzling dish made by Patti Gray using System 96 Black Chord Texture and Mica Powder brushed into the groove. Bits of black stringer are added to break up the linear effect. 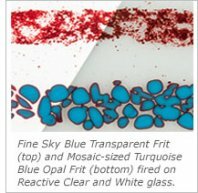 IRIDIZED OPAL SHEETS, 8 x 12"
All Iridized glass for System 96 is fire rated - the iridized surface will handle the high heat of kiln firing without burning off. GREEN SOLID OPAL SHEETS, 8 X 12"
BLUE SOLID OPAL SHEETS, 8 x 12"
Currently available as T-Glass. Has a few darker streaks thru the sheet, some surface bubbles. PURPLE AND MAUVE SOLID OPAL SHEETS, 8 x 12"
RED, YELLOW AND ORANGE SOLID OPAL SHEETS, 8 x 12"
GRAY, BROWN AND CHAMPAGNE OPAL SHEETS, 8 x 12"
RED REACTIVE OPAL, 8 x 12"